Yes the 0 stamina may hurt but given the fact that they throw PvP gear at your head for simple participation you can always equip your PvP gear when stamina is really necessary. Giving up 37 spirit and 4 intellect for 90 ! haste should be an easy choice even for the most spirit devoted healing Priests. Part of the new Primal Moon Cloth set of WotLK. Warlock with Fel Armor will gain extra 26.7sp from this piece. A Frozen Orb. This drops of end bosses in heroic dungeons and can be purchased from Arcanist Ivrenne or Magistrix Lambriesse for 10 Emblem of Heroism. Have fun with this fine piece! is it worth it to for a holy priest get this peice crafted or should one just push for the badge T7 peice? Got this today, and I must say that it is worth it. Looks nice and has great stats. Better use your badges to boost the gear elsewhere, cause this will last for a while. I just think its funny that you cant sell it to vendors..
How would this fare for a Destro Warlock by the way? It gives you +Stam, +Spirit and a fair amount of Spell Damage. Or is there any other item that is comparable to this one, specifically for Warlocks? (Excluding T7). Just a quick note: This item currently sells for around 1500-1800g on my server but, even purchasing 90% of the mats (I had some of the Frostweave and a Frozen Orb), having a robe crafted would have cost lest than 500g and that's including a pretty decent tip. Edit - Neglected to mention that if you buy just the mats listed on the mat table up above you will have to buy Moonshroud cool-down's to have it crafted, unless you just buy the Moonshroud outright. Personally I bought the Moonshroud CD's, which brought my previous price up 150g. For resto druids that don't have the gold yet, you can go for a cheaper alternative: Ymirjar Physician's Robe, which can be bought from the AH for only about 60g. compared to the Moonshroud Robe, and is about 1,700g cheaper. Also, comparison of resto druid T7 vs. Moonshroud Robe here. Just a quirk but I didn't like the way that my Male BE looked in it. I crafted a Blue Linen Shirt and it matched perfectly. Our big hair and prissy looks are already boarder line. I didn't think that I needed to show any skin. If you're up for a bit of Rep grinding, the Robes of Crackling Flame from the Kirin Tor faction vendor (Exalted) may be a viable and cheap alternative. You lose 89 Spirit but gain 26 MP5 as well as 42 Haste; the final conclusion comes down to whether or not Spirit is an overly dominant stat for you. 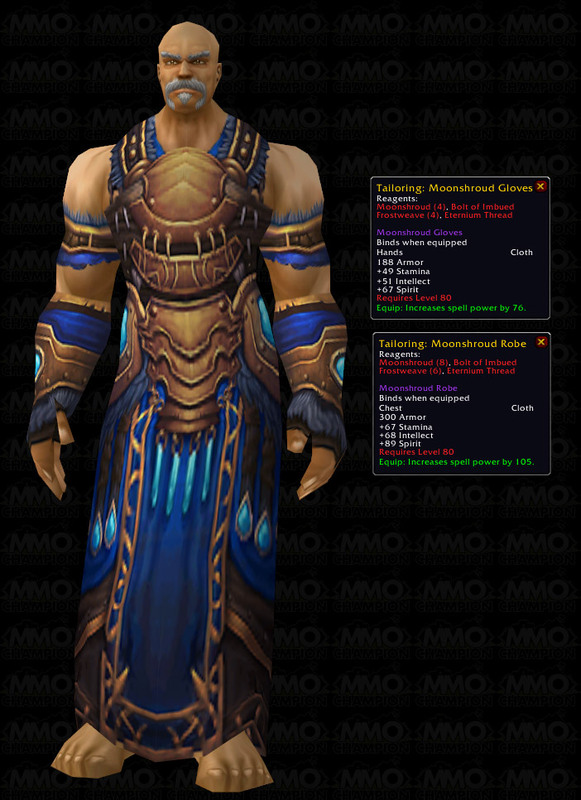 According to RatingBuster, my own observation against Target Dummies, and Wowhead's weight scale, the Moonshroud Robe (and Gloves) serve us Demo Locks better than Ebonweave or Spellweave considering the +Spirit and the use of Fel Armor (especially when combined with Demonic Aegis). Something to consider...keep in mind I am not a number cruncher by default so don't stone me if I am overlooking something. It's a bit strange- as nice as this robe looks, and with the fact that Moonshroud doesn't have a cooldown any longer, I haven't seen many people transmog their gear into this. However, it looks really smashing when paired with Archmage Mantle, Vicious Embersilk Belt, and Frostwoven Wristwraps. Any smaller glove will do, I'm using Black Mageweave Gloves. The outfit turns out like this. Just ideas for everyone- happy transmog'ing! Looking for a belt to transmorg to go with this? Gloves: Nethersteel-Lined Handwraps or Moonshroud Gloves that are a bit more pricey.